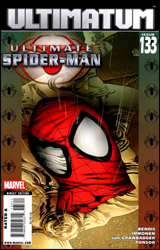 In case you missed the update like I did, this would be a wrap for Ultimate Spider-Man: Volume I. Yes, despite Marvel's assurances that the series was safe from the kind of extinction that seemed inescapable for Ultimate X-Men and Ultimate Fantastic Four, the current run of USM ends with number 133. Following two issues of Requiem, the festivities will resume in August with a new number one, a new artist, and (perhaps) a new Spider-Man. I suppose if the current run had to end, this would be the right way to do it. In light of the book's conclusion, writer Brian Michael Bendis chose to publish its final issue without a single line of dialog. That lack of diction could've made for a very quick, disappointing read, but between Bendis's thrilling plot and Stuart Immonen's fantastic visual storytelling, it never felt short on substance. In fact, the silence played into the story brilliantly. When the issue opened, moments after an enormous explosion had rocked the concrete beneath Spider-Man and the Hulk's feet, it produced a shell-shocked, white noise sort of sensation. I felt like my ears were ringing as everything fell into slow motion, surrounded by a faint light haze. As the issue progressed, that effect transformed to embody more of a stunned, speechless disbelief while it became less and less likely that Kitty and Spider-Woman would find Peter's body. No words could have delivered a stronger impact. In Stuart Immonen's swan song with the character, he's delivered what is likely his strongest performance. Naturally, a wordless episode seems tailor-made to showcase the skills of the artist above and beyond those of the writer, but that sword has blades on both sides of its hilt. Under such circumstances, a bad artistic showing could be amplified just as much as a good one, if not more so. And despite my general love for his work, I must confess that I've seen some slack in Immonen's Ultimate Spider-Man efforts lately. In this issue, though, that's all a distant memory. This is Stuart Immonen taking over the show, pulling every last tool out of his box and putting it all on display right there on the page. Nobody delivers a sense of staggering perspective like Immonen, as evidenced by the fireball engulfed two-page cityscape that opens this issue. Few show restraint as effectively as he does a few pages later, during the fight scene between an enraged (and, literally, inflamed) Hulk and a fleet of Military helicopters. And, perhaps most impressive of all, he has few rivals when it comes to the kind of complicated emotions that flood the faces of Spider-Man's supporting cast as the tale goes through its paces. From the unrestrained fury of the Hulk to the heartbroken concern in the face of Kitty Pryde, there's nary an expression that goes untouched in this issue's thirty-two pages, and Immonen nails every last one. Incoming artist David LaFuente has some humongous shoes to fill when he takes over later this summer.